Where to Park in Weybridge? | Curchod & Co. Whether you are meeting a client for a business meeting over lunch or attending one of the local networking events in Weybridge, there are several car parks throughout the town with some offering seasonal tickets for regular users. Here is a brief overview of some of the local car parks available to you, should you wish to relocate to the town and commute by car, along with some prices. However, this is not an extensive list and more information can be found here. Churchfield provides a car washing service, free disabled parking for up to three cars, secure and well lit spaces all a close proximity to the town centre via a passageway to Church Street. Regular customers can also benefit from a generous 60% off daily parking charges by purchasing a seasonal ticket for £892 per year or £233 per quarter. In addition, to the above customers can also pay for the parking via a mobile phone on the mobile app or online by accessing the RingGo service. Baker Street car park also provides quick access to the town centre via a short walk down Baker Street to Church Road. This site may not be suitable for wheelchair users who may require wider bays, as unfortunately disabled parking isn’t provided. Regular customers can also benefit from a generous 70% off daily parking charges by purchasing a seasonal ticket for £671 per year or £178 per quarter. In addition to the above, customers can also pay for the parking via a mobile phone on the mobile app or online by accessing the RingGo Service. 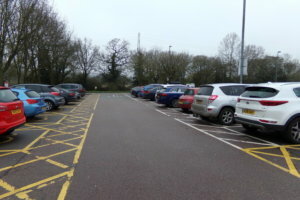 Should you require affordable parking throughout the town, then Parkopedia can provide details on availability, distances to the town centre, an overview of facilities that are available at each car park as well as a list of parking fees, helping you to make an informed choice when visiting the town centre perhaps for a bite to each or a networking event. Situated on the South Western main line, Weybridge railway station provides direct services to London Waterloo with an average of 180 trains travelling there per day and the fastest route reaching London in just over an hour. The station facilities include waiting rooms, toilets and a café on Platform 2. You can also reach the town centre which is 7 minutes away by bus or 20 minutes on foot. Moreover, lifts to the platforms also provide step-free access for those who may have restricted mobility. Tickets to London Waterloo cost around £8.30 for a single adult fare. More information on Weybridge train station can be accessed via the trainline website.